True, students aren’t expected to have plenty of work experience. And yet, the structure of the ready-made resume is created to focus on the practical skills rather than work. It often happens that students gain experience in volunteering during the time at college. So, why don’t you let your prospective employers know about it? How to Use Student Resume Template? Using any of the presented student resume templates is no rocket science. After making a purchase, you will be able to download the resume bundle containing the CV files in .doc or .ai formats. Being a skilled user of Microsoft Word or Adobe Illustrator is enough to be able to edit them. Print-ready resume templates, 300 DPI resolution. In other words, as soon as you’re finished editing the initial resume, you can print it out right away. Owing to labeled and organized layers in .ai files, editing the initial design won’t take much time. Once you’re done with making the needed alterations, you can export the finished file into a PDF document or send it by email. 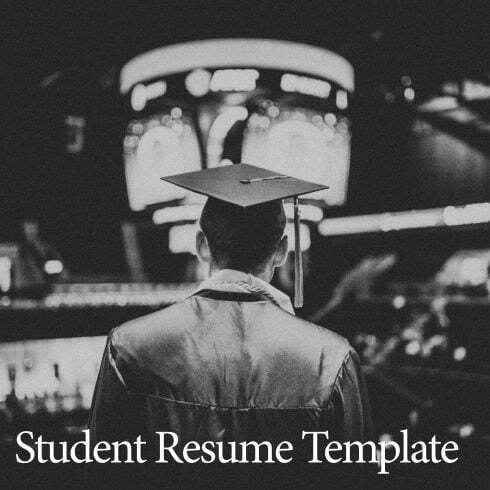 Select the best student resume template to land your first job smoothly!